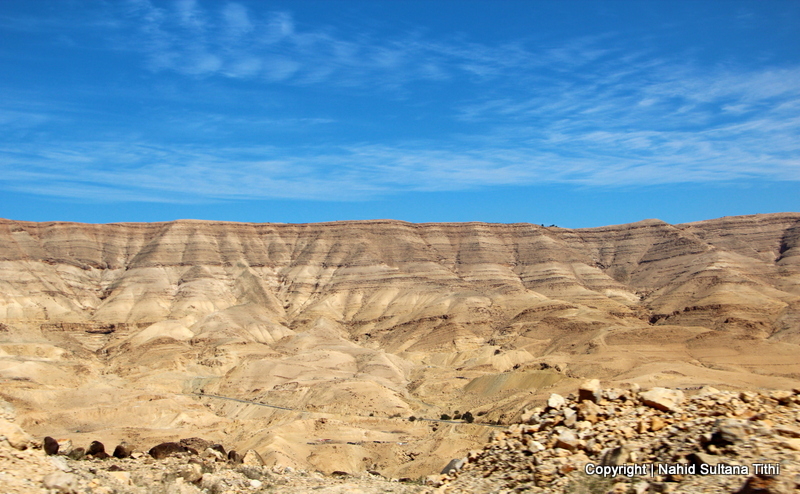 Petra, also known as Wadi Musa or Valley of Moses, is like an open-air museum and the main attraction is the ruins itself. 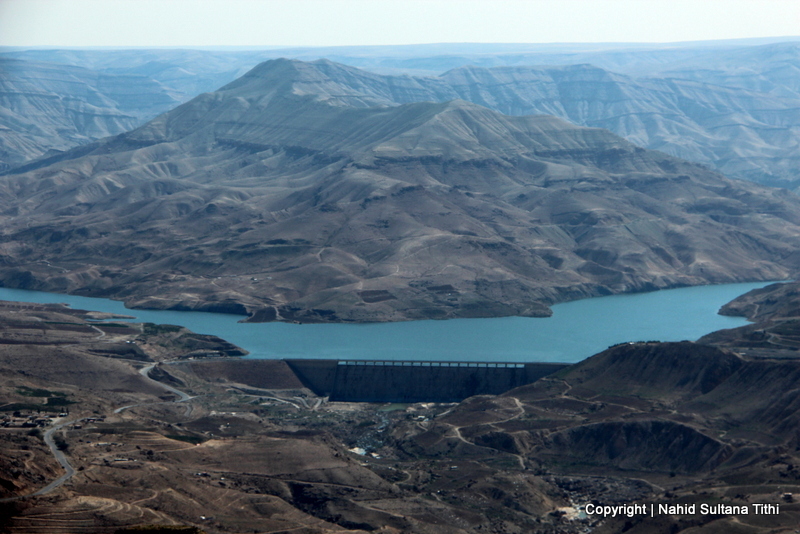 You need at least one day (or few days) to explore the major sites of it. 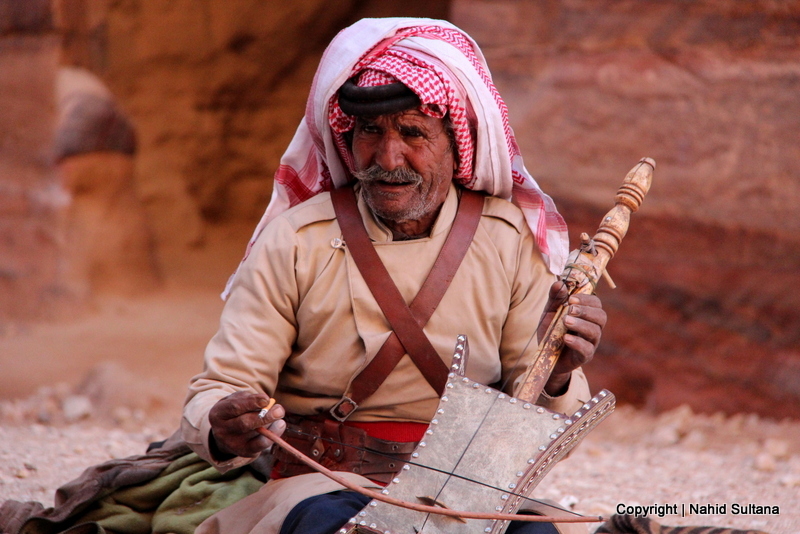 Petra enchants travelers with its revealing appearance and bold history. It never fails to impress them. 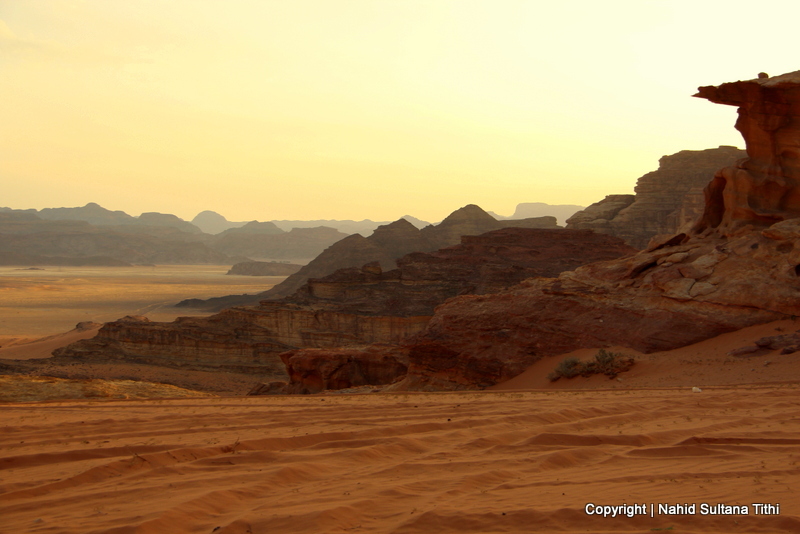 There is no place like this on earth and its beauty is beyond any expressions. 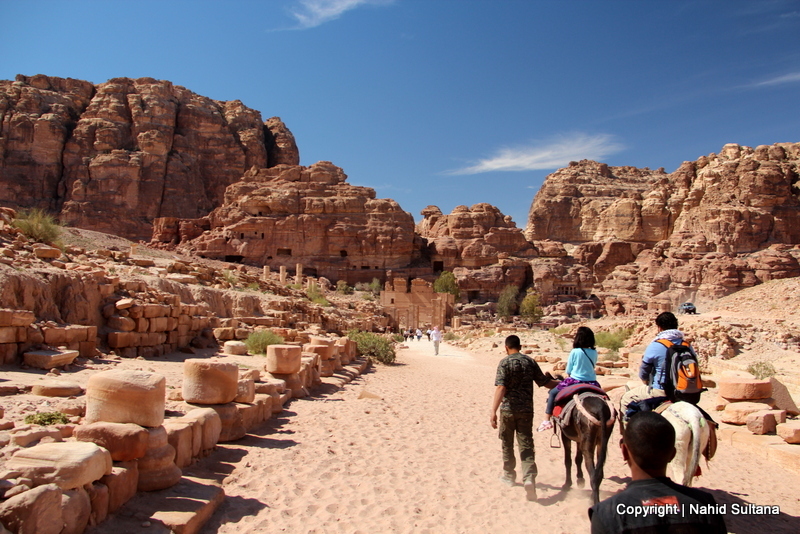 I saw many images of Petra before traveling there, but they come nowhere close to what we experienced. For the history of Petra, I will copy the information from the information board that I saw near the visitor center…I think that sums it up very well. “Petra, as the capital of the Nabataean Kingdom, thrived as an important trading post on the international Spice Route, serving as a crossroad between Arabia, Egypt, Palestine, Syria-Phoenicia, India, China, and the Mediterranean Basin. 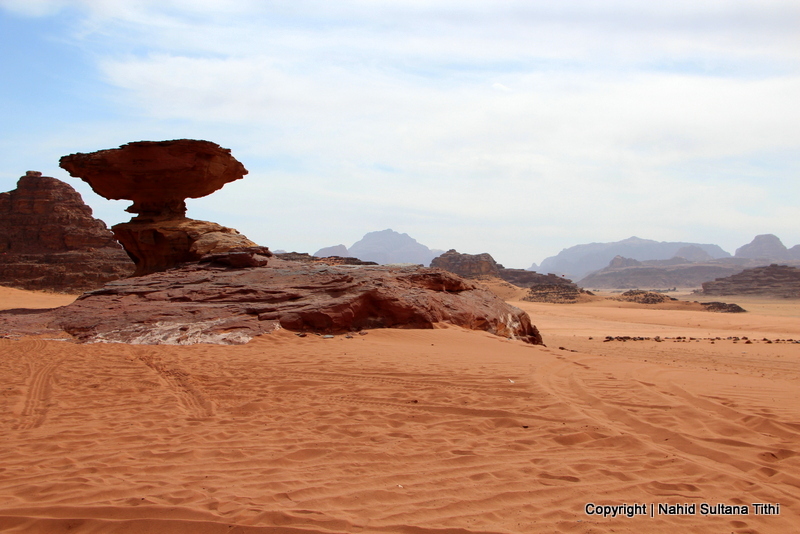 Nestled within intricate geological formation of mountains and gorges are the impressive tombs that the Nabataeans carved out of the sandstone rock faces. 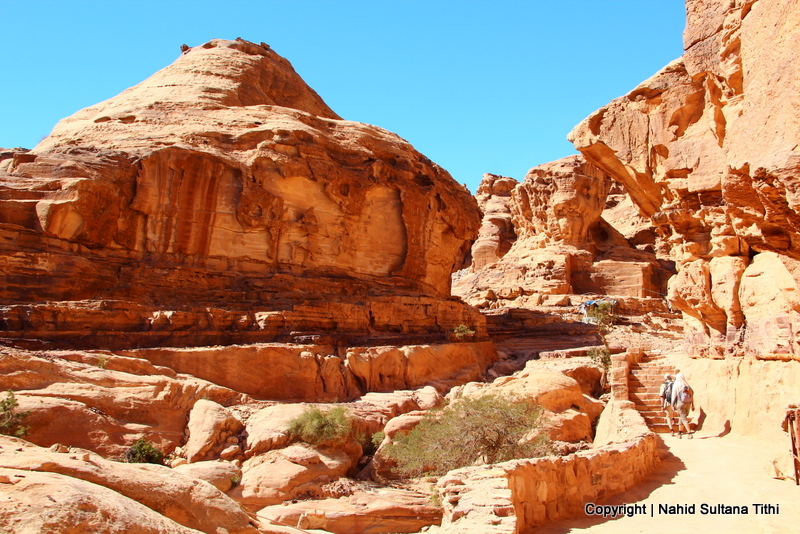 Nabataeans, Romans, and Byzantines built the city of Petra from the 2nd century BC to the 5th century AD. Whilst the architectural facades of the tombs are a harmonious blend of ancient Assyrian, Egyptian, Hellenistic, and Roman styles, archaeological excavation in Petra have brought to light that the city itself survived well into the Byzantine period.” — From information board of Visitors Center in Petra, Jordan. 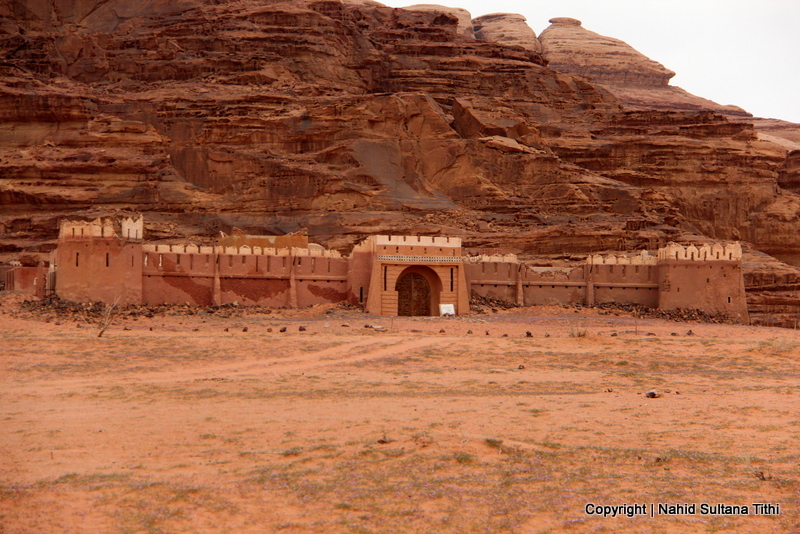 Hundreds of caves and tombs of Nabataean Kingdom in Petra, Jordan. The picture came a bit out of focus because I was on a mule. 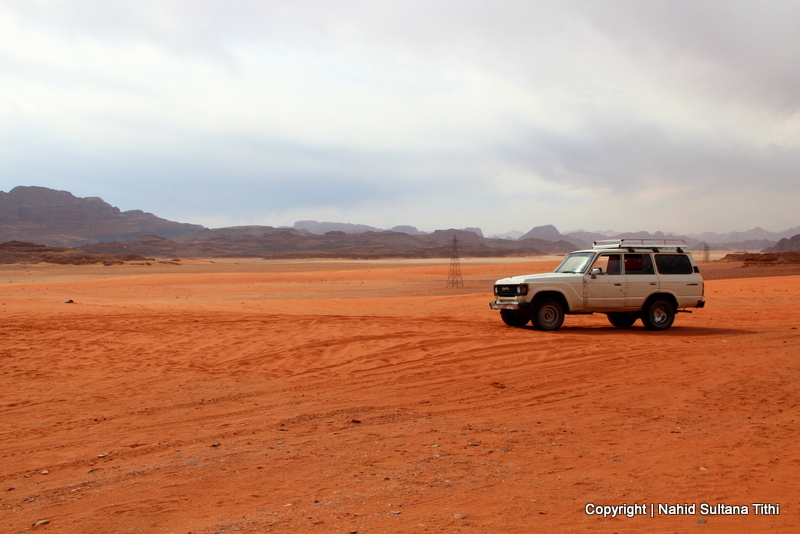 TIME of TRAVELING: We stayed in Jordan all together about a week. 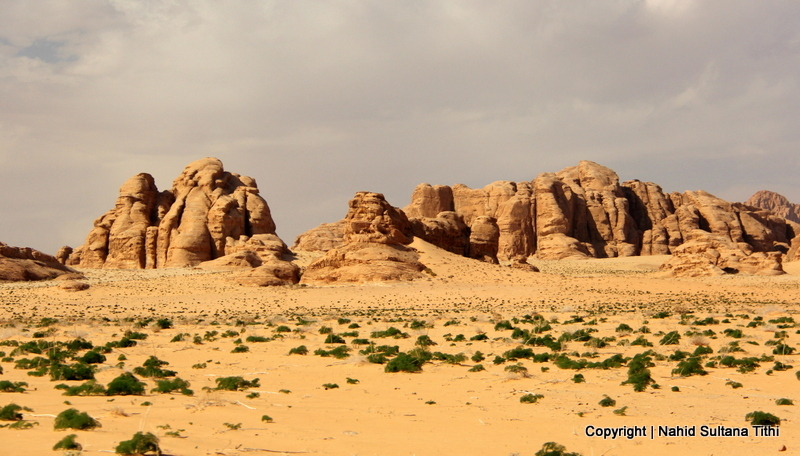 Out of that, we spent 2 nights in Petra and one full day exploring the valley and its ancient history. It was mid-February of 2013. Although we were prepared with our jackets the day we were in Petra (all the visitors were actually carrying jackets/sweaters) but when you have to walk few miles those jackets eventually end up either in your backpack or tied to your waist. That’s what happened to us too, but it did get a bit chilly in late afternoon when we were walking back to our hotel. Other than that it was a perfect day to do some outdoor hiking with kids. OUR HOTEL: We stayed in Movenpick Resort in Petra, right outside the Visitors’ Center. I don’t think I need to say much about Movenpick, it’s a 5-star hotel…very luxurious rooms with excellent customer service. 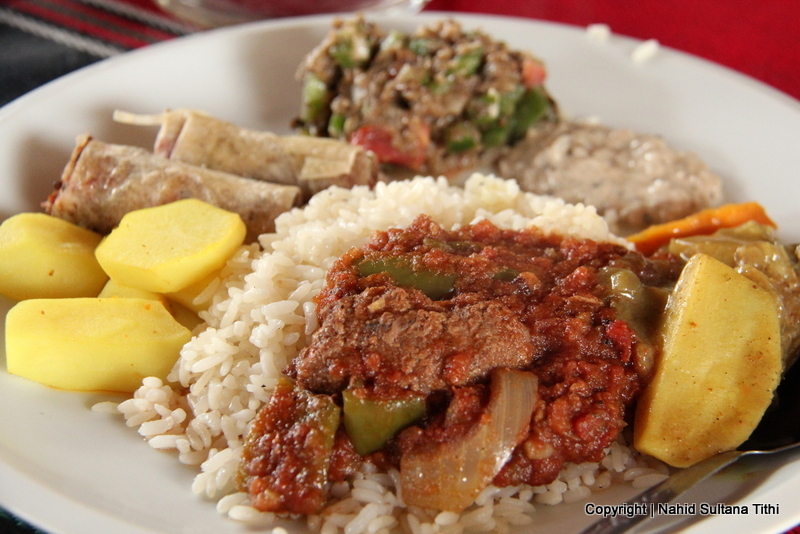 Wi-Fi wasn’t free but breakfast buffet, with variety of different items to choose from, was free for its customers. EATING and SHOPPING: We had lunch after 4 pm the day we spent in Petra. We were dead tired and just went to the first place we saw, which was luckily next to our hotel. It was nothing fancy, but had some good soups and pizzas. 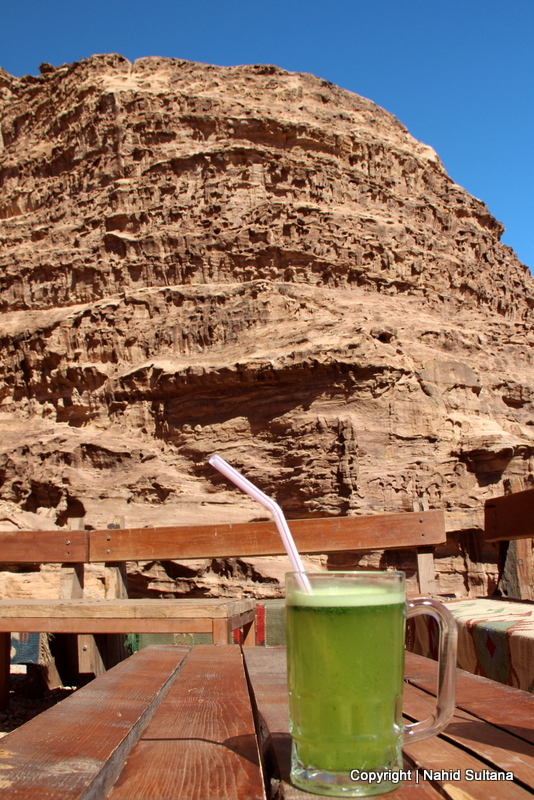 There are many restaurants and cheaper places if you are willing to walk 10-15 minutes from the entrance of Petra. 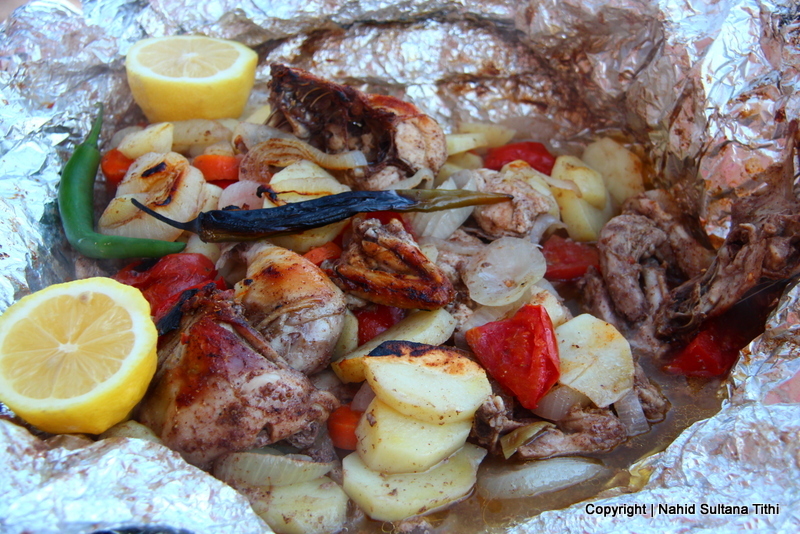 If you are hungry inside Petra, few restaurants/cafes are available after crossing Khazana and Roman Theater. I didn’t see much of shops there, I guess I wasn’t looking at the right directions. 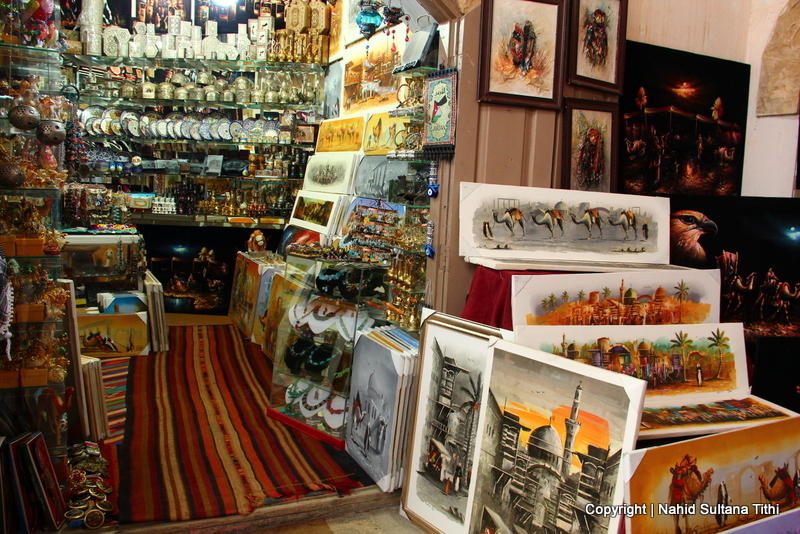 I saw a souvenir shop on top of the mountains when we arrived there with our donkeys, and a mule to go to the monastery. 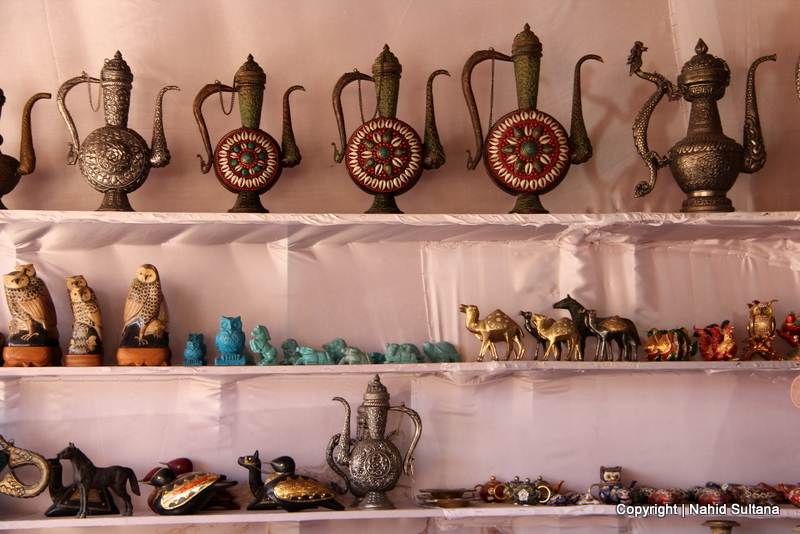 Oh and also saw many Bedouin ladies selling local trinkets in the valley and on the mountains. 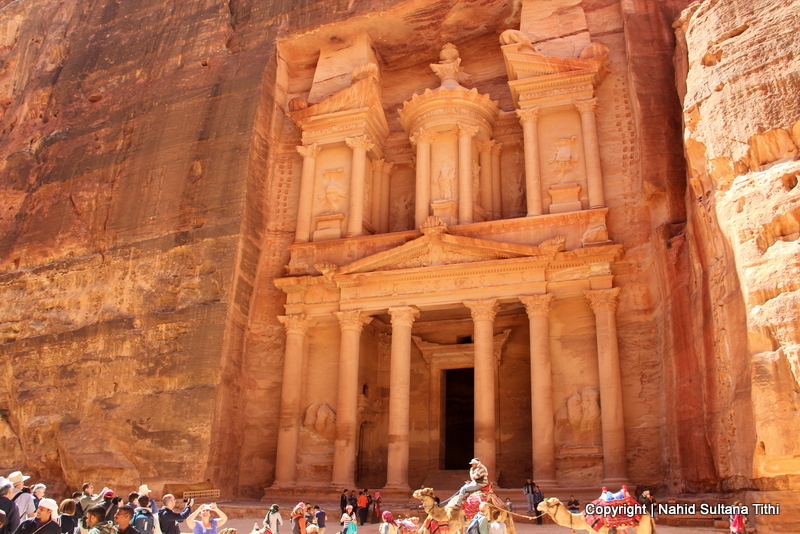 PLACES WE’VE VISITED: I tried to break our visit of Petra in few different segments to make it easy on me and my readers. 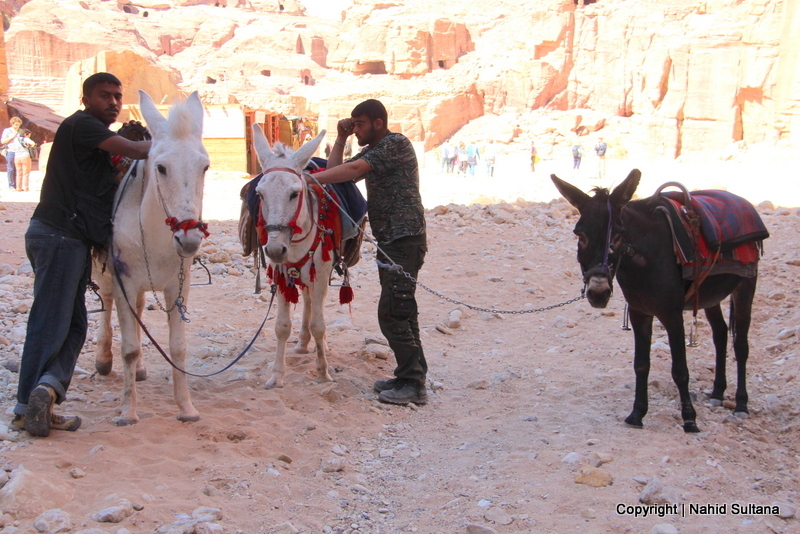 We did rent 2 donkeys and a mule to help us climb more than 900 stairs to go to the monastery and then later a horse-drawn carriage from Khazana to the main entrance of Petra thru Siq. It just made it a whole lot easier on the kids and us…can you imagine climbing 900 stairs (they are not even stairs either) with a 7-yrs. and a 3- yrs. and then walk another 15-20 minutes to the monastery? 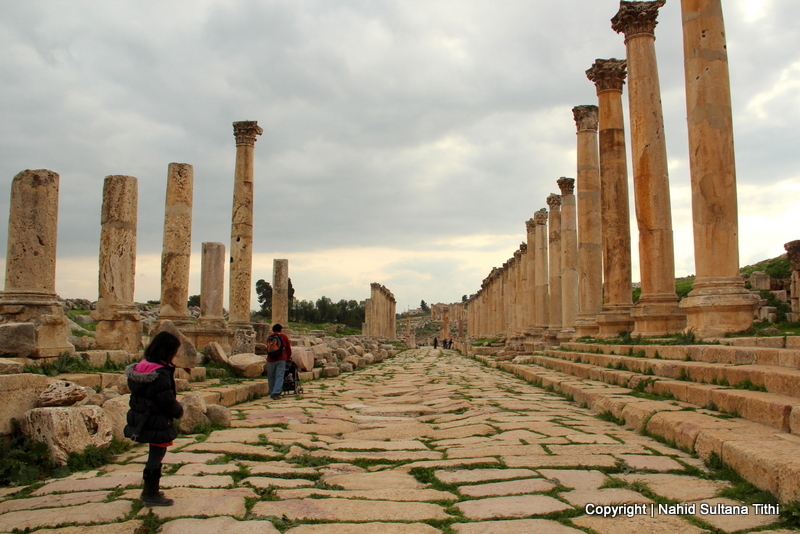 By the way, both of my girls were still sick from our previous day-trips in other parts of Jordan, I truly appreciate their courage and support on this trip. Rent for 2 donkeys and 1 mule (with 2 guides) – From Khazana to Monastery and return is 60 JD + my husband gave them 20 JD tips. 60 JD rent was bargained before we rode on the animals…very important that you do it. This portion of tour took only 2 hours…thanks to those lovely animals for doing the hard work. Tourists often come from Israel on day trips and hence the ticket category is different for them. 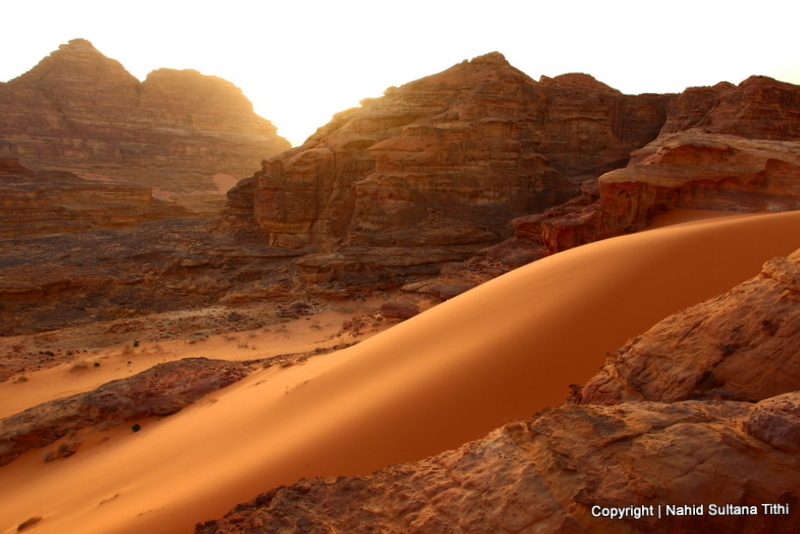 You may have either to show your passports or your hotel keys (if staying overnight in Petra) to prove that you are not a day visitor in Jordan. Djinn Blocks (Djinn is a type of spirit in Arab folklore) are free-standing cube-shaped monuments which served as tombs and memorials to the dead. 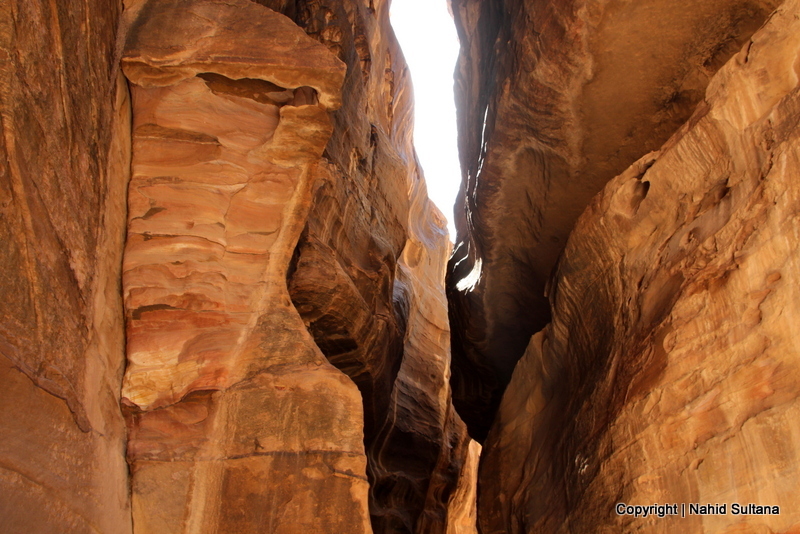 There are only 3 or 4 of them near Bab Al-Siq but a total of 25 Djinn Blocks can be seen in whole Petra. 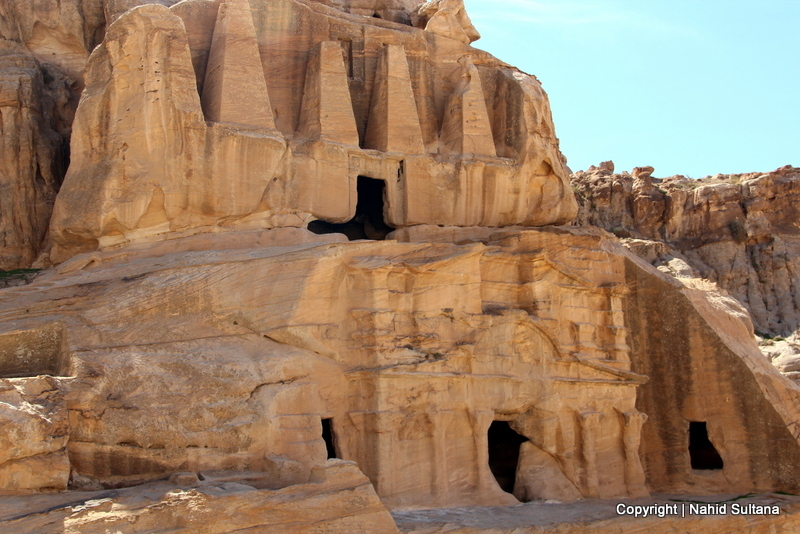 These are some of the earliest tombs carved in Petra in around 2nd to beginning of 1st century BC. 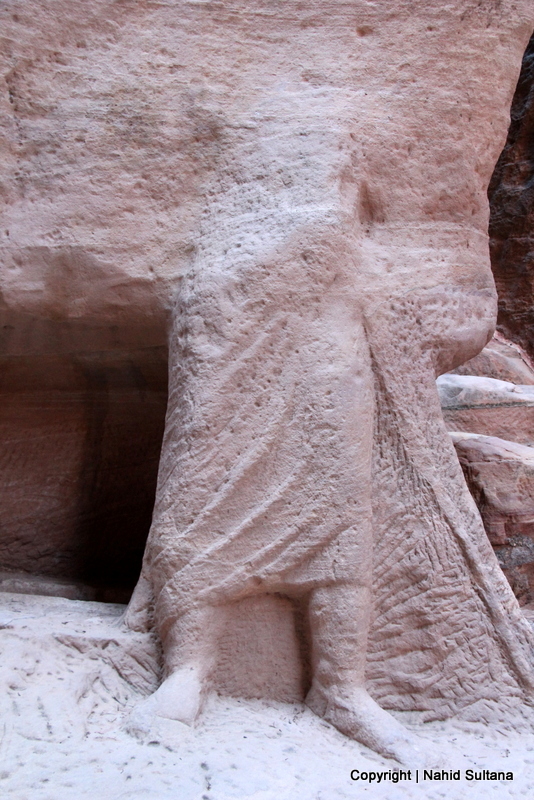 Obelisk Tomb and Bab Al-Siq Triclinium were carved from sandstone cliffs around 25 – 75 AD. Petra’s Bedouin inhabitants named the entrance of Siq “Bab Al-Siq” meaning Gate to the Siq in Arabic. 2) THE SIQ: The real beauty of Petra begins as soon as you enter Siq. You can’t imagine its grandness without being here physically. 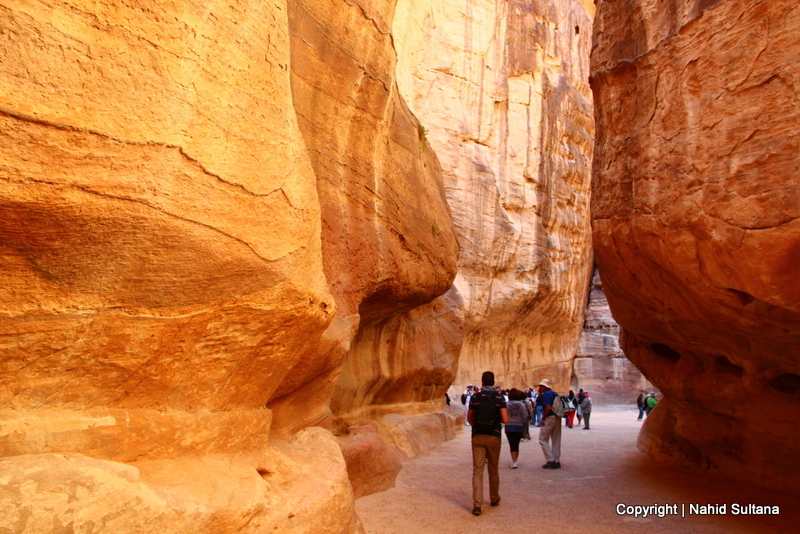 This narrow 2 km passageway takes you right in front of the most popular attraction of Petra, the Khazana (Treasury). 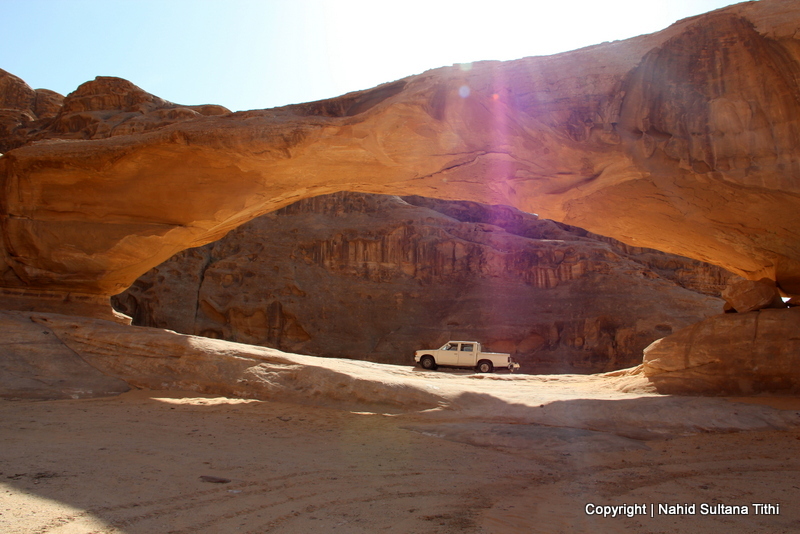 Siq is a natural sandstone gorge that gently winds towards the ancient city of Petra. This was once the main entrance to the city. In its day, Petra was a bustling city that witnessed a constant procession of travelers, visitors, and pilgrims, who passed along this same path. 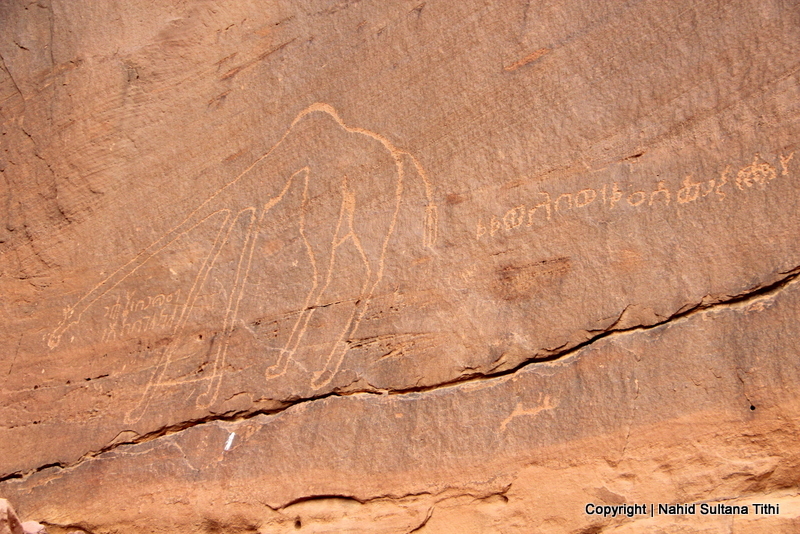 Many carved blocks and petroglyphs can be seen throughout the Siq. 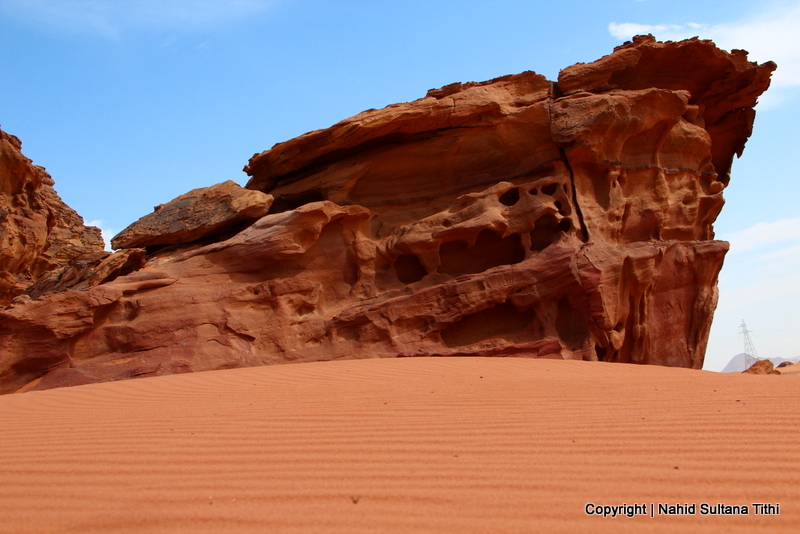 Different shades of colors of the canyon and fascinatingly beautiful shaped rocks give this place a different charm. I have never seen anything like this before. 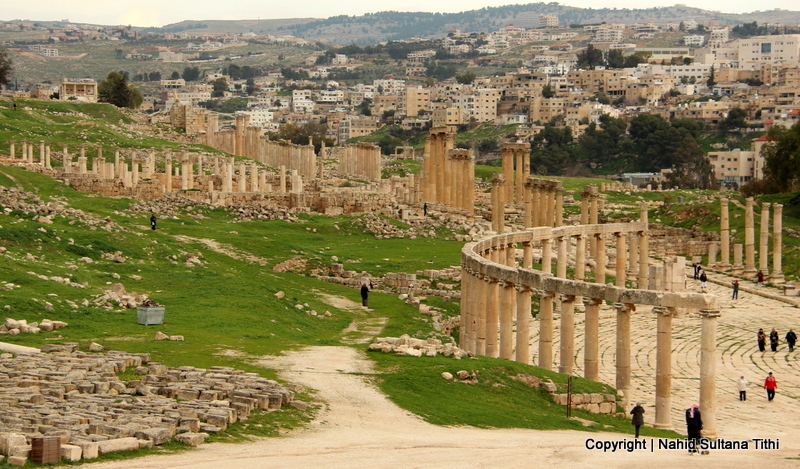 This is where natural wonders collide with ancient world. Many remnants of Nabataean history can be seen inside the Siq. 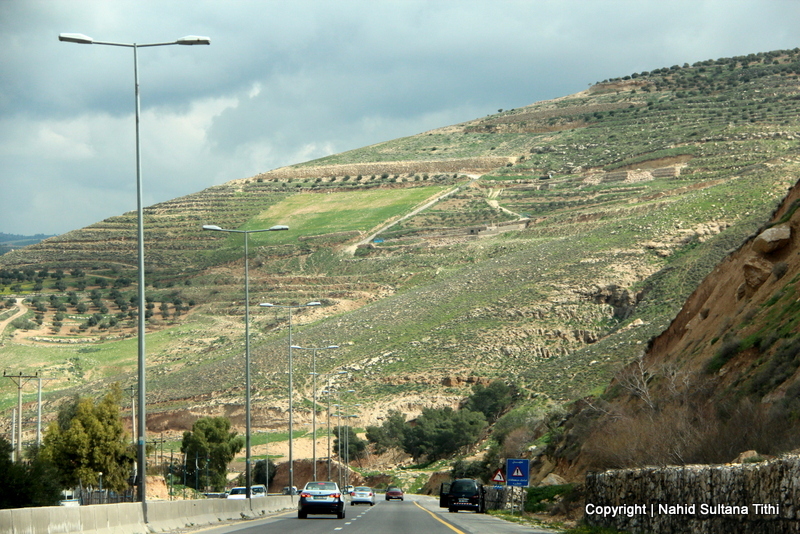 Among these are the paved road and Nabataean sacred stone blocks. 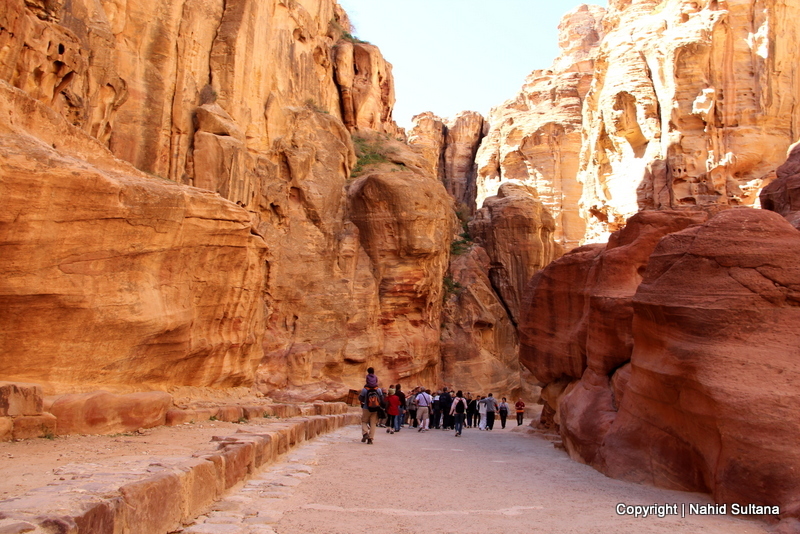 The paved road in the Siq was originally constructed by the Nabataeans, possibly towards the end of the 1st century BC. Limestone was used for the paving and portions of that road still exist in some areas of Siq. 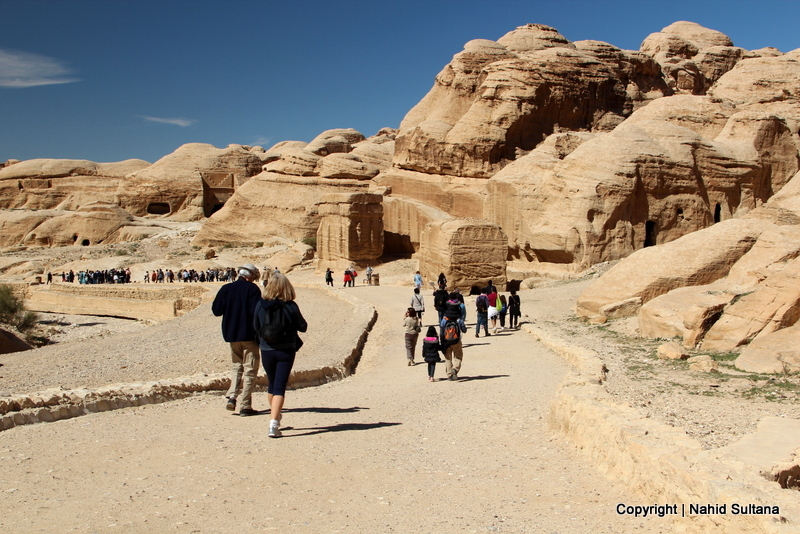 3) Al-KHAZANA (THE TREASURY): After 3 km of walk, Siq dramatically opens up to a magnificent view of the Khazana. 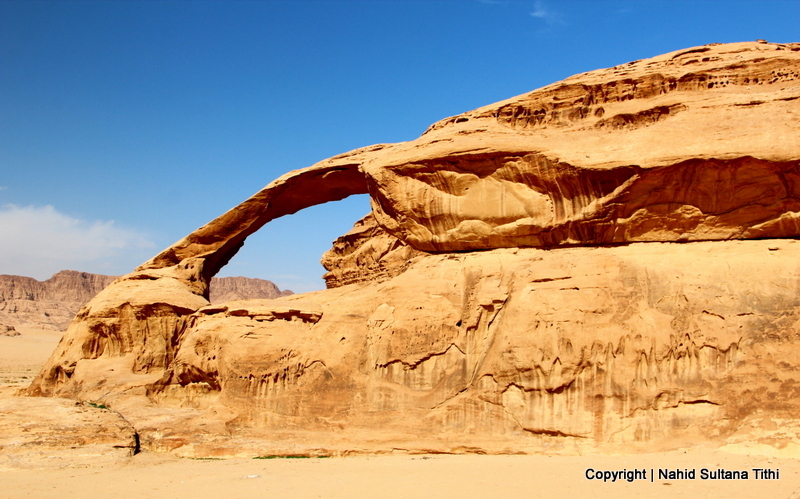 This towering façade is the most spectacular monument carved by the Nabataeans from 60 BC – 50 AD. It was impressively carved out of a single block. 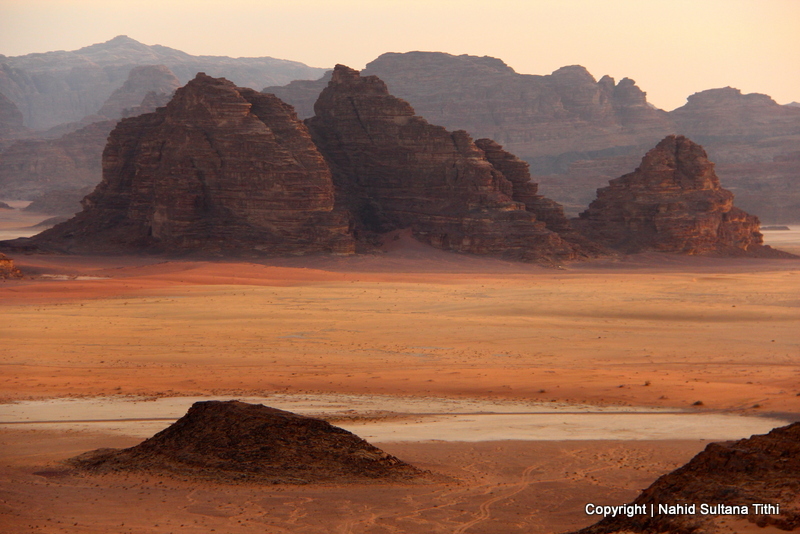 The name, Khazana, comes from a local Bedouin legend that Pharaoh hid a treasure in the urn at the top. But in reality, it is a mausoleum and would have been used for funerary purposes. Tourists are not allowed to go inside Khazana. 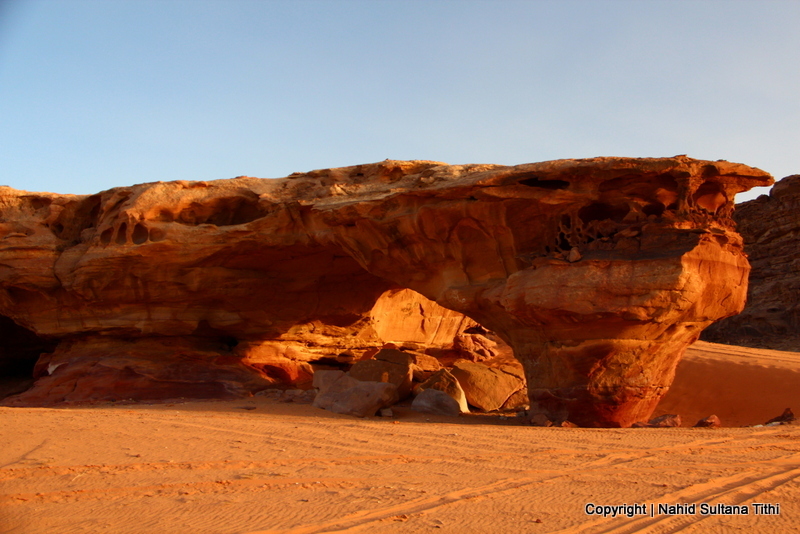 So we rested in front of it for about half an hour while enjoying and appreciating the talented Nabataeans for Khazana’s imposing appearance. By the way, this is where Spielberg’s “Indiana Jones and the Last Crusade” was filmed starring Harrison Ford. Most of visitors of Petra end their journey here, especially if they are with groups or on a day-trip from Amman or other cities. 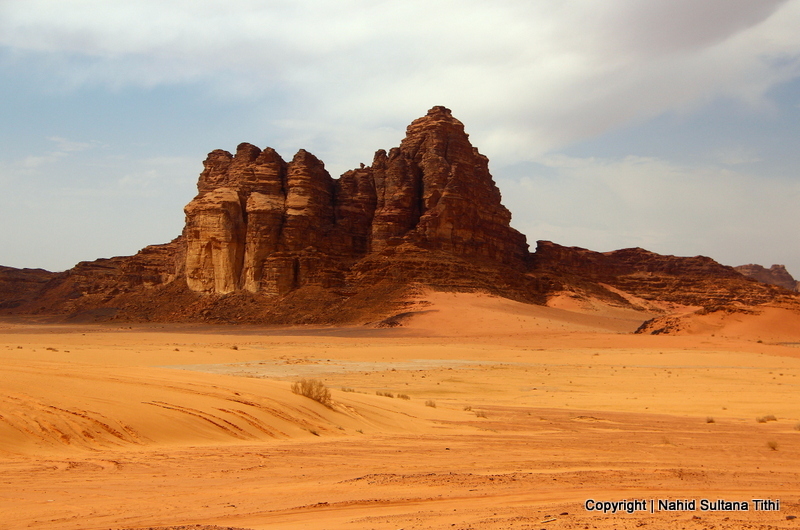 But this is just the half of Petra’s ancient secret. 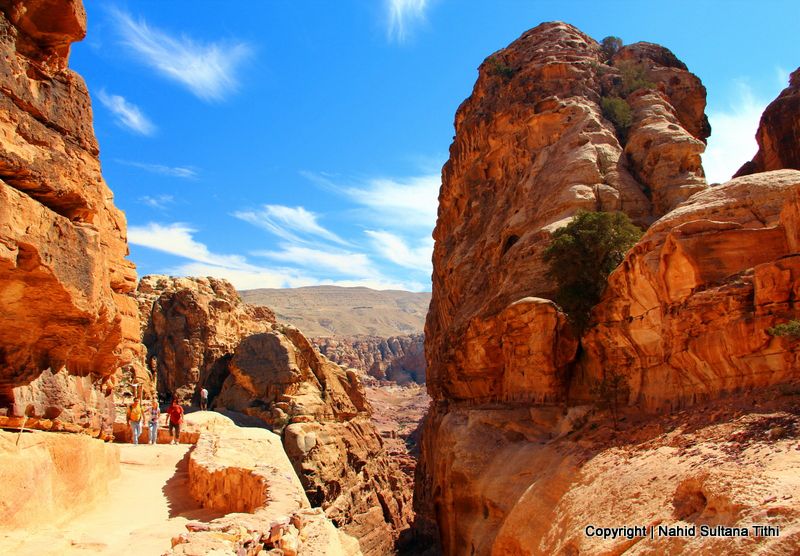 I would highly recommend travelers to pass this point and start going towards the monastery, otherwise you will miss out a lot of scenic sites that Petra has to offer to its guests. 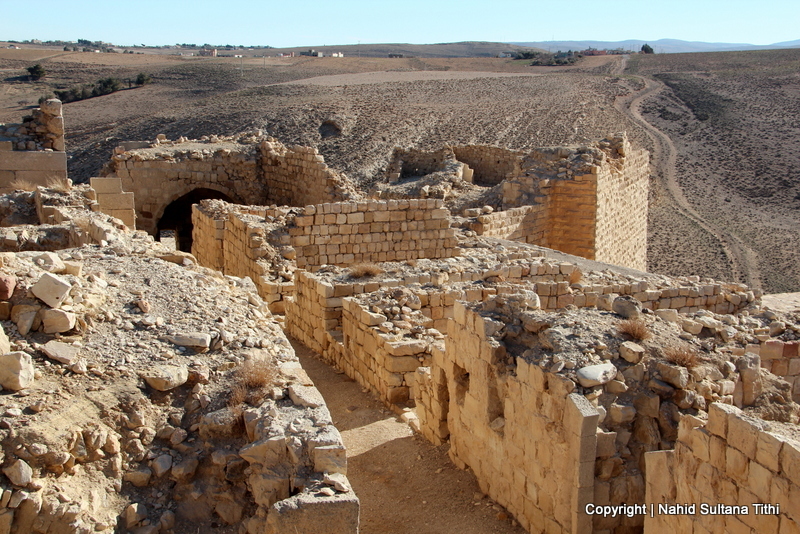 4) ROYAL TOMBS, CAVES, and RUINS: Leaving Khazana behind to our left, we walked thru another small natural passageway and came in front of a large valley. 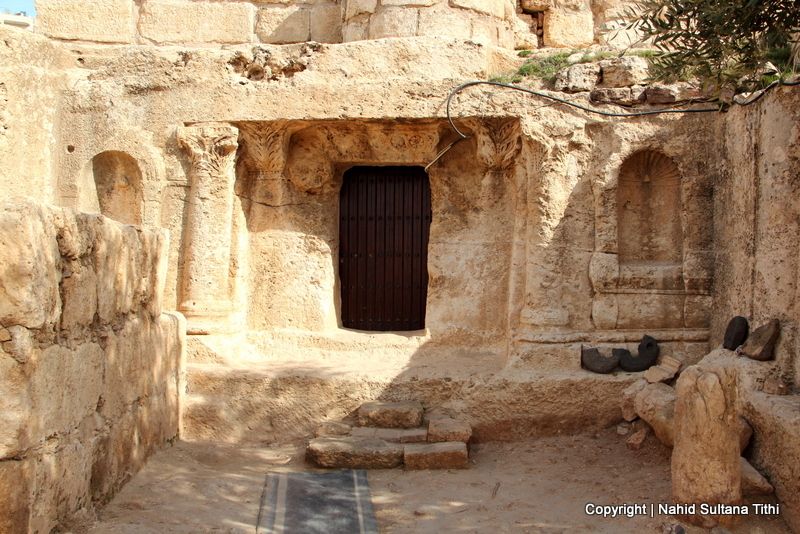 Some of the tombs here dates back to 200 BC. 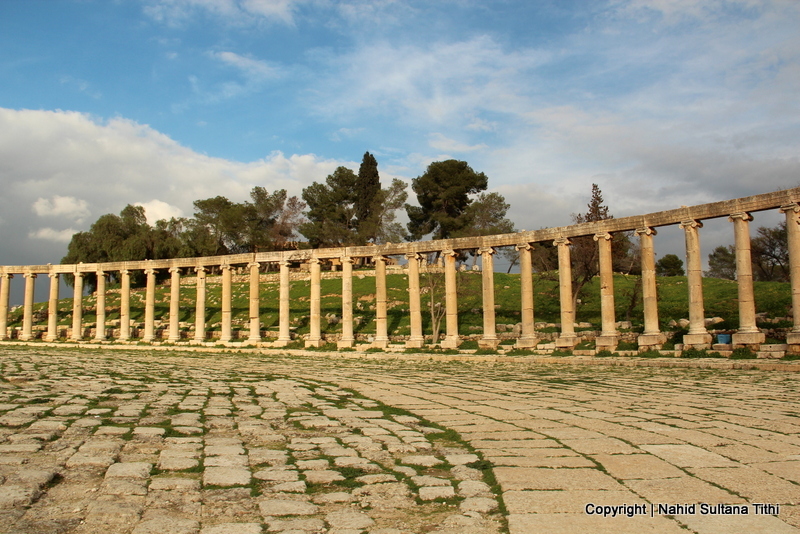 There is also a 3000-seat Roman Theater from the early 1st century AD in one side of the valley, a Roman style Palace Tomb, and many royal tombs to your right up on the hills. These caves, tombs, and carvings on mountains look like paintings of nature. The beauty doesn’t end anywhere…every corner has surprise, every rock of this valley has some uniqueness. Various walks and climbs reveal hundreds of rock carved tombs and temple façades, funerary halls, and rock reliefs…enough to keep your eyes busy for hours and days. We rented our 2 donkeys and a mule from here. 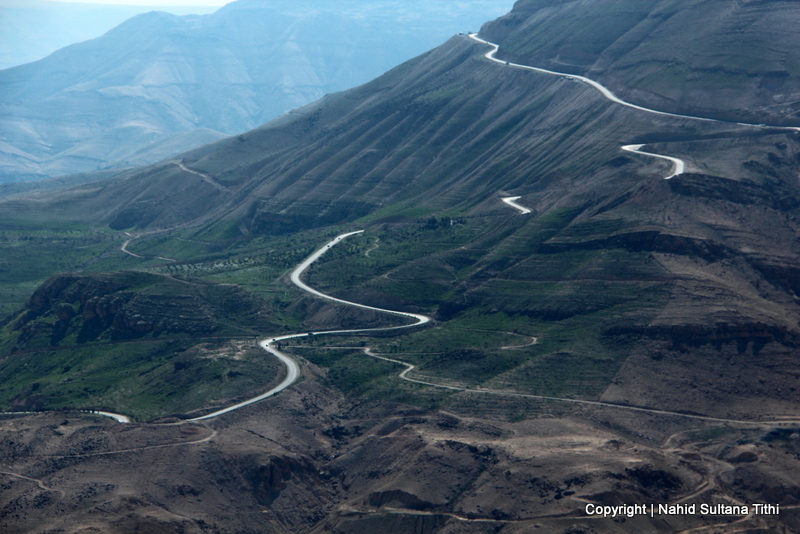 Now I was exploring Wadi Musa (Valley of Moses) riding on my mule. This was much easier than riding a camel (we rode on camels in our trip to Pyramids of Giza in Egypt). I felt much comfortable and was actually able to take pictures using my both hands…it felt so cool. 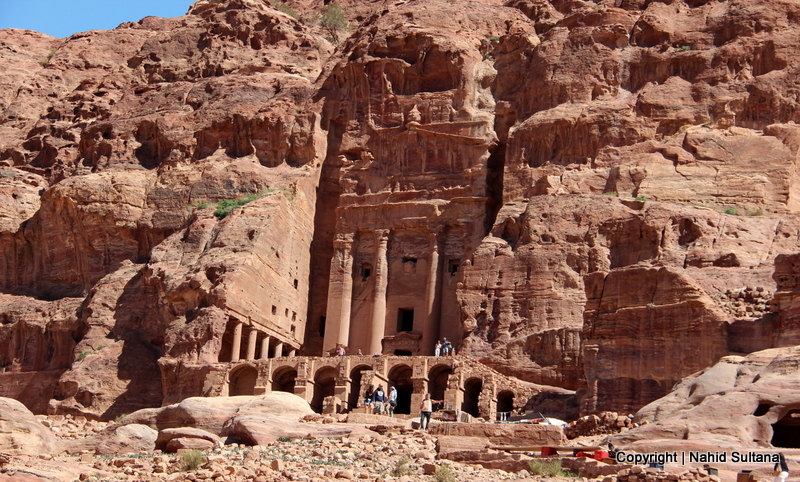 Many other Roman ruins can still be seen in this part of Petra. 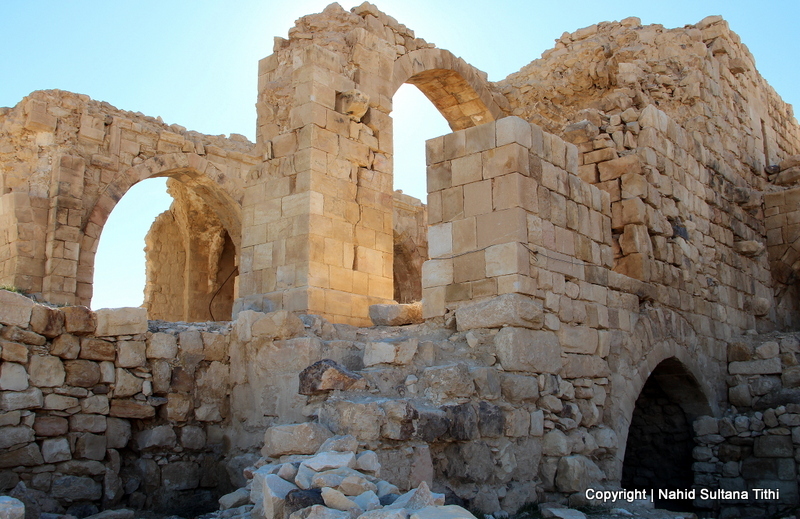 Massive columns and old limestone walls will take you back to those bygone days. This was a long way from Khazana before we actually started climbing the stairs to monastery. 5) WAY to MONASTERY: I think there are hundreds and thousands of caves and tombs in Petra, they are almost everywhere you look. Some of them are natural and some are hand-cut. 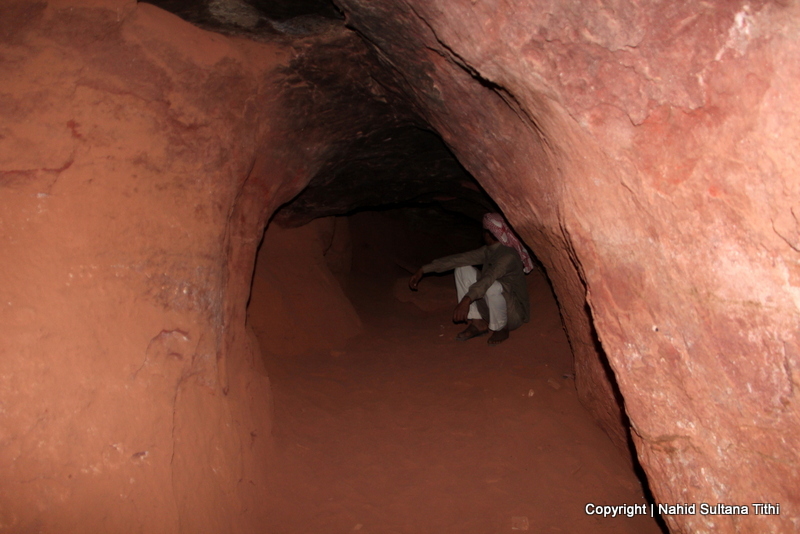 Our guide with the animals were two Bedouins who reside in some nearby caves in Petra. 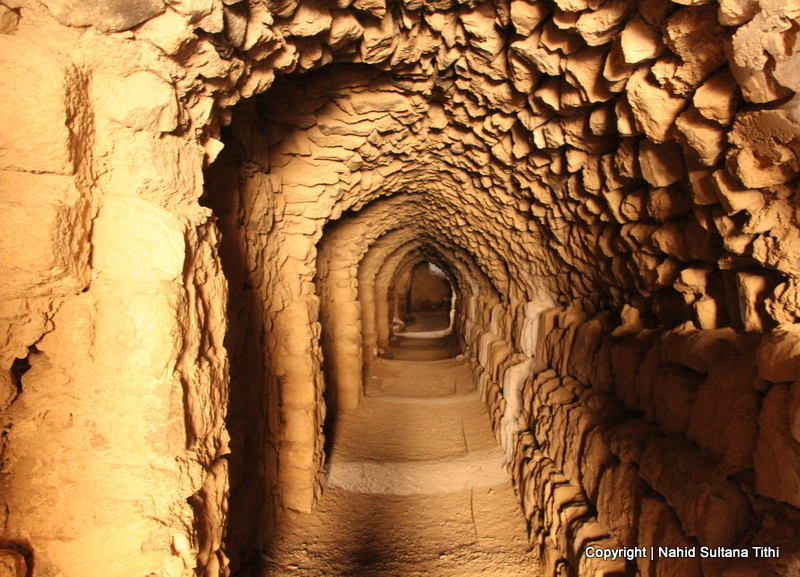 They were saying in hot summer days these caves become very cool and pleasant while in winter they become very warm and cozy. So, after all the ruins and royal tombs the climbing began. 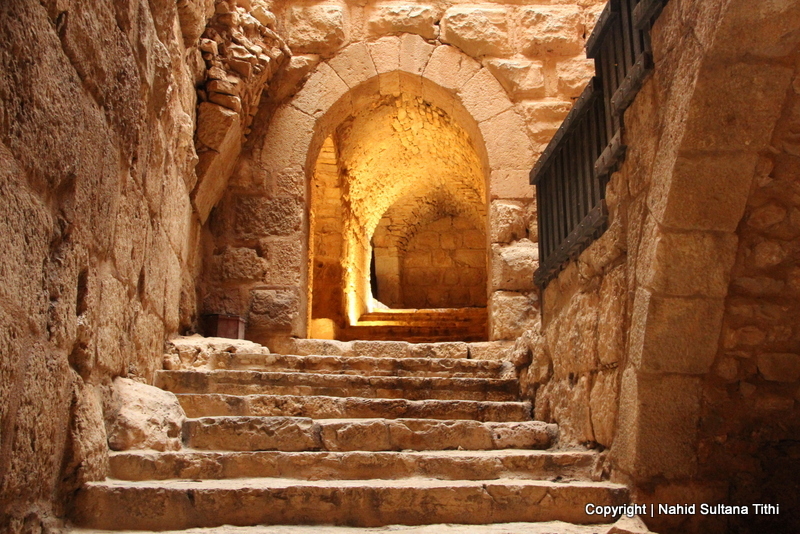 There are more than 900 unevenly cut steps to go all the way top to the monastery. The donkeys were very fast climbing although at times I thought he would drop me from his back to the deep down gorge. It was thrilling no doubt but kind of scary too. I scratched my one knee at one point since my mule decided to walk so close to the wall that it had forgotten my legs needed some space. But I would have done it again if I had to. These animals can go up to a certain point of these mountains with tourists. 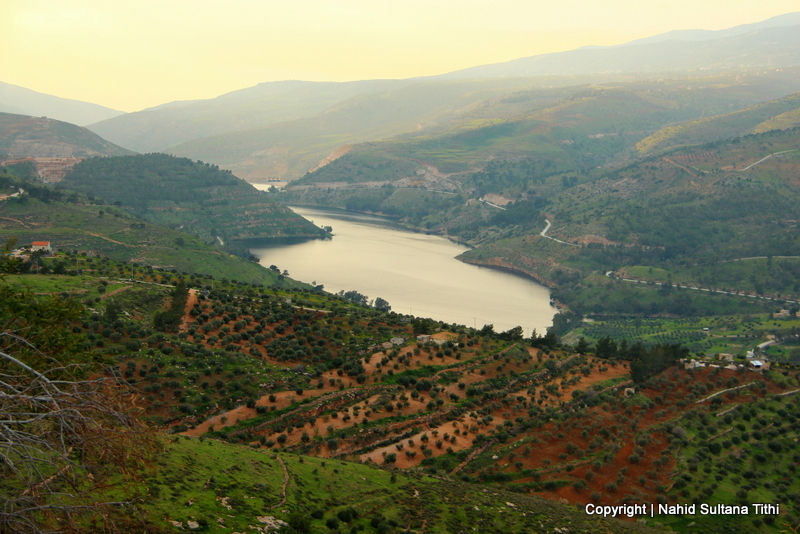 After that the Bedouins and the animals stayed behind and we walked little bit and climbed another 50 steps before some more great views of the valley opened up to us. 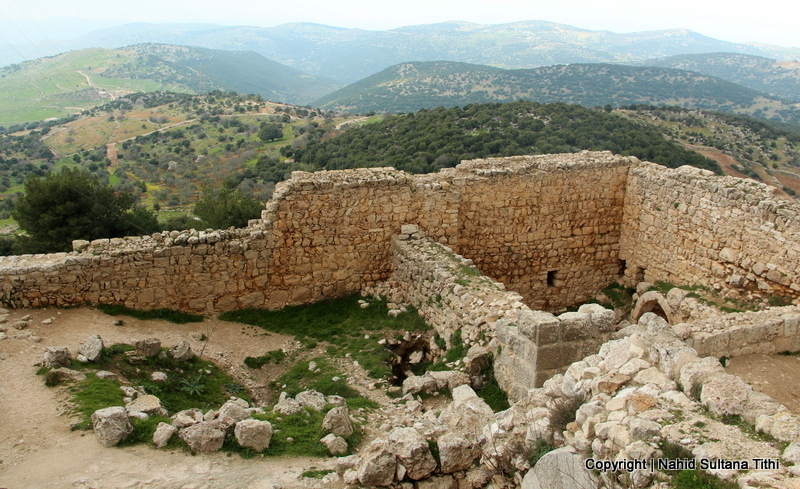 6) THE MONASTERY: Deeply carved into a cliff face of a mountain, known as Jabal ad-Dayr, the façade is traditionally known as “the Monastery”. 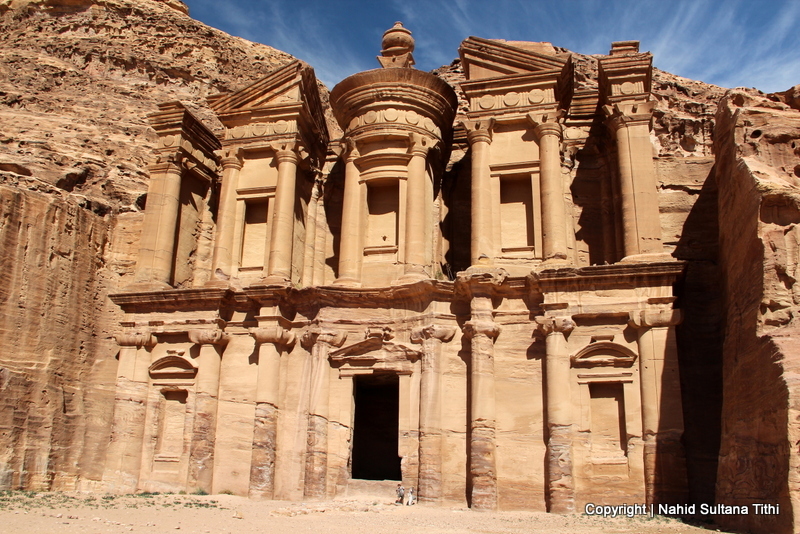 Built in 85 BC, this is one of the largest monuments in Petra. It looks very similar to Khazana but bigger in size. There isn’t anything to see inside the monastery except for its 3 enclosed walls, but visitors are allowed to go in and take a look around. This was the end of our tour basically. 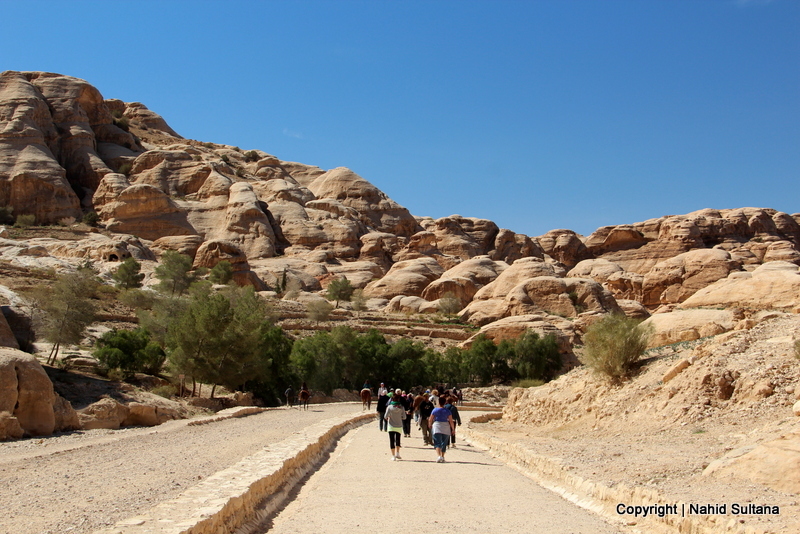 There is a panoramic hill where people hike to see 360 degree view of the Petra city. But all of us were too exhausted to take anymore extra steps. 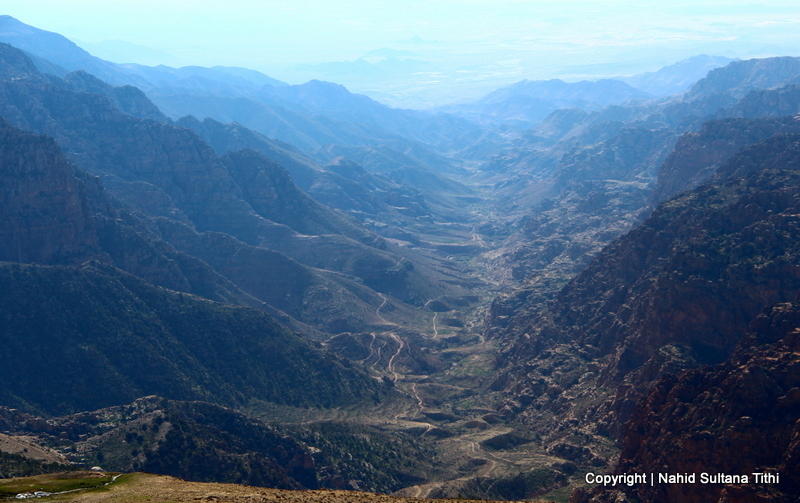 From monastery we head back to our guides, went down some 900 steps, and back to Khazana where they picked us up from. From there, we rented a horse-drawn carriage to take us back to Visitors’ Center to avoid that 3km walk again. We were hungry, tired, sleepy, but absolutely satisfied with this journey. 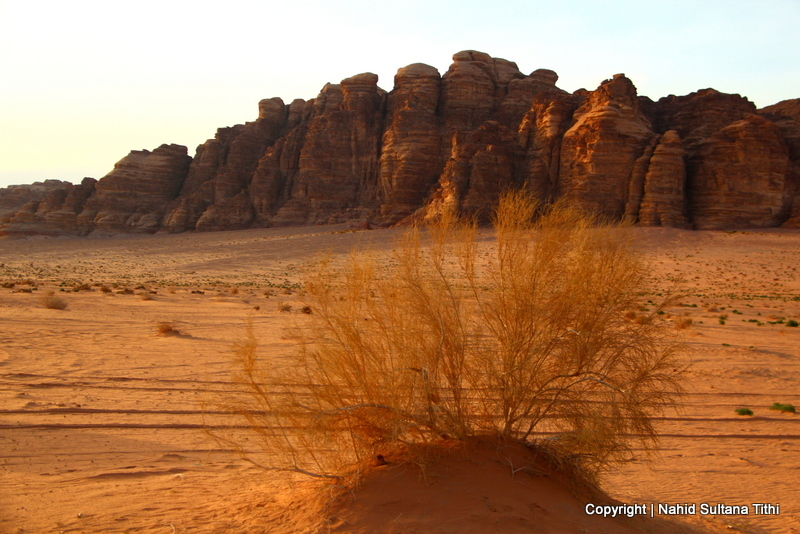 Petra is the most valuable treasure of Jordan. Thanks to the local authority for keeping this place so organized, clean, and safe for visitors. 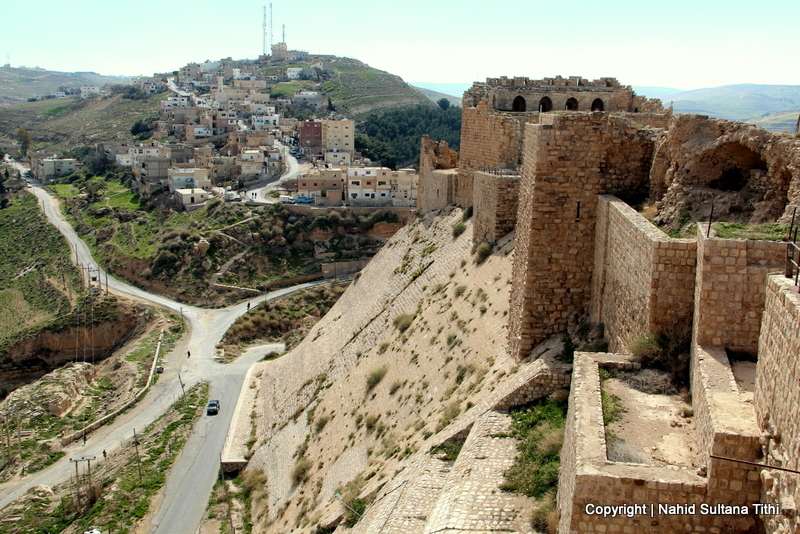 Every traveler must visit Jordan to see Petra, the “Lost City’, and its endless forget-me-not beauty. PETRA by NIGHT: This is the best way to experience Petra’s look at night, which I missed due to my high fever. My husband went with a big group. This can only be done as a guided tour with officials of Petra Visitors’ Center. Tourists first walk about 1 km from the Visitors’ Center to Siq, then 2 km from Siq all the way to Khazana following a candle-lit path. 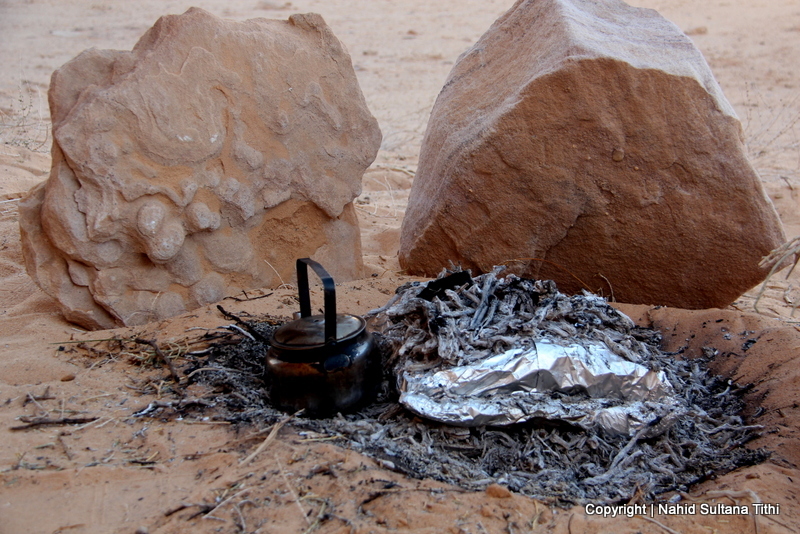 Here everyone sits down, rests, and drinks a cup of tea under the open sky, served by the Bedouins. 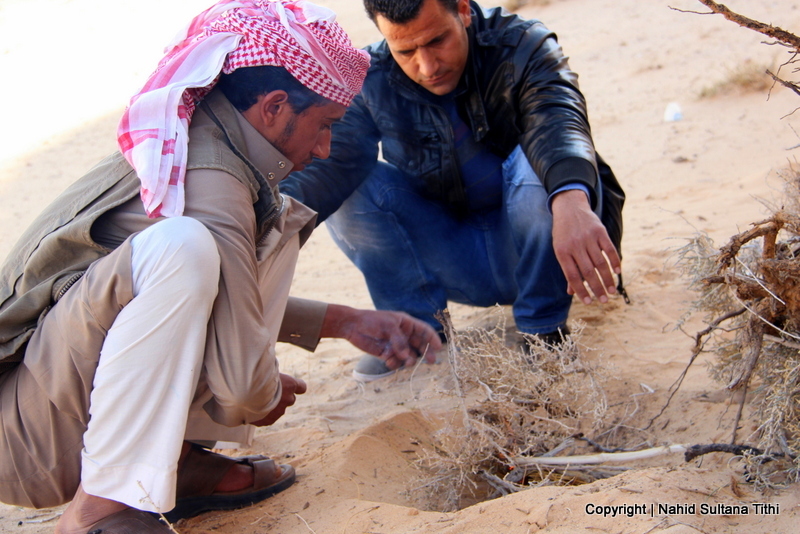 As my husband said, while they were drinking tea, a man gave them some history on this place followed by musical performance by a Bedouin. This whole trip is magical because the whole Siq and in front of Khazana are decorated with hundreds of candles on both sides after dark. 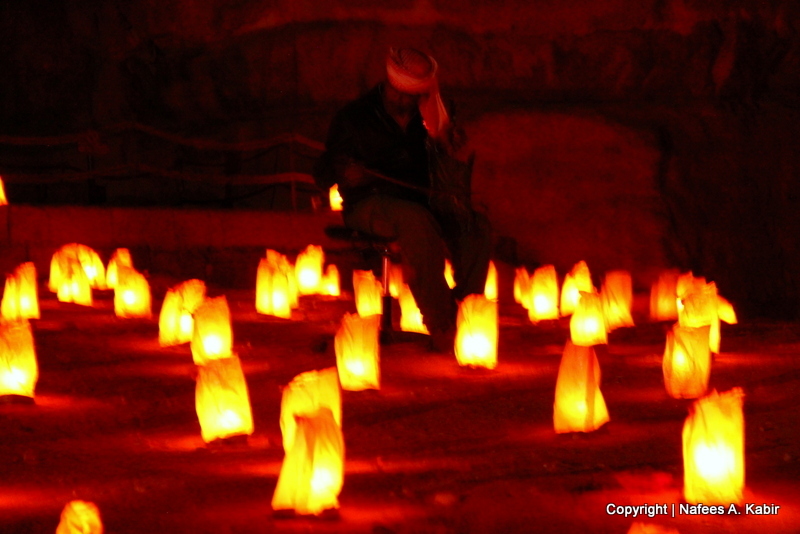 Although I didn’t go there, I can visualize the adventure of walking thru narrow passage of Siq at night surrounded by many many candles…must feel like you are in a different planet. The charge is 12 JD per person to take this walking tour at night. My husband bought the ticket from our hotel reception and just showed up in front of the visitor center of Petra 10 minutes before the tour started. The event takes place Mondays, Wednesdays, and Thursdays of every week. The tour started at 8:30 pm and took about 1 ½ hours to finish up.